Midsummer Container Herb Garden. 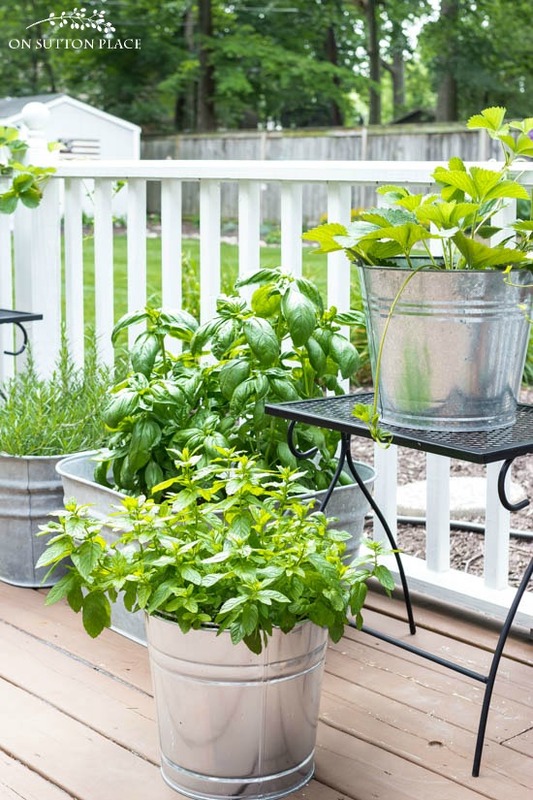 Grow herbs and vegetables on a deck or patio. 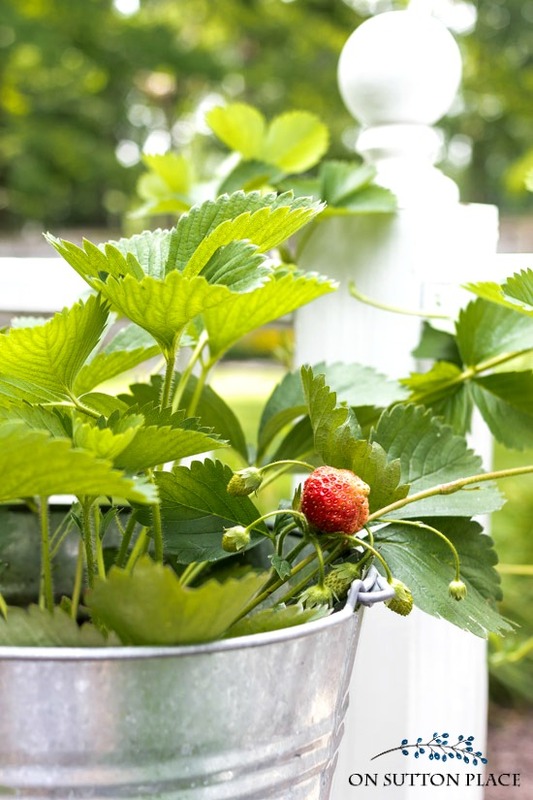 Garden watering tips, growing tomatoes in containers, strawberry plants. I will be the first to admit that I’m not an expert at gardening. I have no formal training and everything I know, I learned by doing. I’ve made tons of mistakes along the way and each growing season, I wonder what will come up and what won’t. A garden is sort of like life…it changes all the time and the best thing to do is just roll with it. Even though sometimes I’m not sure what I’m doing, occasionally I see success. I would categorize my midsummer container herb garden as successful…at least so far! This year my container herb garden is growing like mad. Everything looks healthy and huge. My cherry tomatoes have grown to be over three feet tall and there are loads of green tomatoes on the vines. Click to see my early summer container herb garden! All I need is some hot weather so the tomatoes ripen and I’ll make good on my promise to share my recipe for Caprese Salad. *Author’s note: the tomatoes ripened so here’s the Caprese Salad recipe! 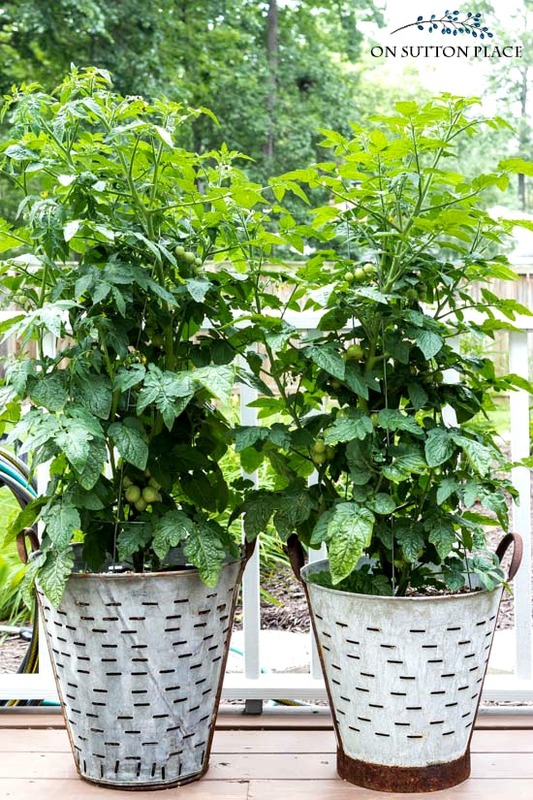 Tip: Put a hose stand very close to your container garden so watering isn’t a chore. I’m still trying to figure out the strawberries. I have two plants that are growing beautifully but they aren’t producing much fruit. I realize now that two plants probably isn’t enough. Next year I want to plant several and I also want to plant them earlier. I think I was a little late. I put the buckets up on tables so the strawberry vines weren’t laying on the deck. Some of the vines are getting long enough to drape over the porch railing. I’m still hoping, but my dream of making fresh shortcake with my own strawberries is quickly fading. So far I’m picking one or two at a time and eating them right on the spot! 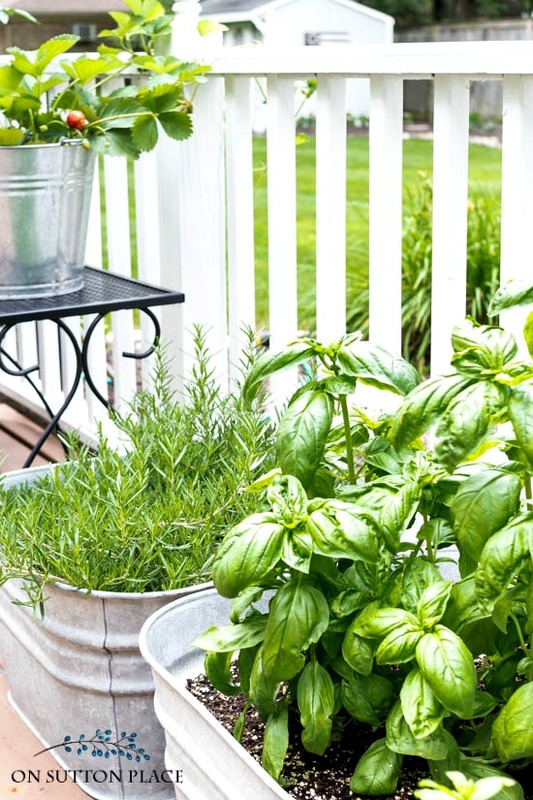 The best thing about a midsummer container herb garden is having rosemary, mint, and basil right outside my back door. I cut fresh mint every few days to make infused water. It’s totally refreshing and takes just a few minutes. Here is my method. 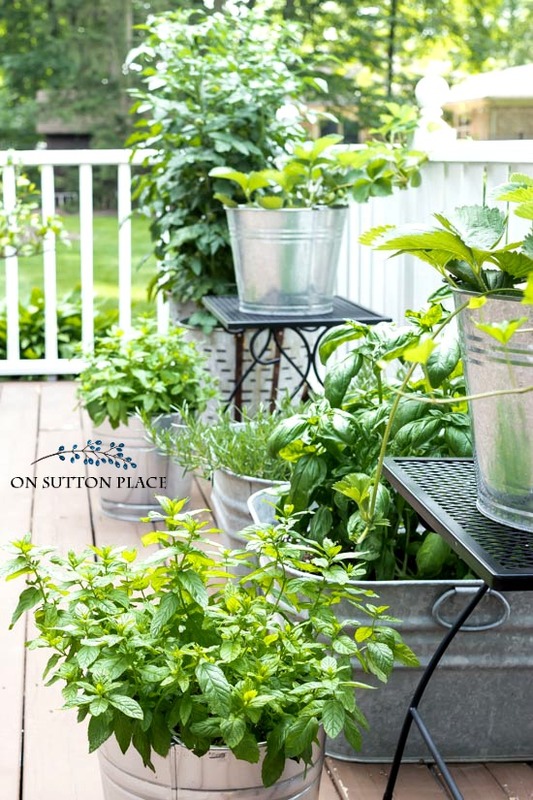 Tip: If your herbs are growing faster than you can use them, include them in garden flower arrangements. Not only are they beautiful, they smell wonderful. I feel like the summer is going by so quickly and if I could, I would stop time. I can’t though…so here’s my wish for you today. Try to take a few minutes and do something you enjoy. It doesn’t matter what…just stop and smell the roses! Thank you so much for this information. I have had trouble with purchased basil and losing some. Off for new plants and your information. Ann…you are the best! I love your blog and all the information you provide! Thank you for sharing all your ideas. I love your herb garden! Do you put holes in your galvanized buckets or a layer of rocks? I have so enjoyed your articles – thank you! I live in Georgia and planted 2 strawberry plants this year as well with similar results. FYI someone told me recently it takes 2 years to get them to produce abundantly. I’ll find out next summer if I can get them to through the winter. I love your photographs. You have such a great eye for color and design. Love your blog. When so people want my email/blog attention…… I give it you. I so enjoy it. And I learn so much! Can you help me with my tomatoes? I live in southern California at the coast. Not one tomato, and the foliage looks awful. Then lots of sun and I water about every two to three days. Too much water? Yours look so so amazing! Hi Sunny…I’m sorry but I don’t have much advice for your area. If it’s hot and sunny you may have to water more often. When it’s super hot I try to water my containers every day. Perhaps try some fertilizer to jump start them a bit? Good luck! Love your blog. In VIctoria, Australia we are in mid Winter -5 to 15c so I love looking forward to your Summer projects and planning my containers. I have a good herb garden but endeavour to have fresh basil, mint etc handy to use as you do. I find washing fresh herbs, wrapping them in damp paper towering and popping in the vegetable section of the refrigerator handy for a few days. Love the container garden, I’m definitely going to attempt tto start next spring with a herb garden as eell. Thanks for sharing. My mint is under attack by some Sorr of leaf eating bug. Any suggestions? It could be slugs or Japanese beetles. Right now the Japanese beetles are chewing on my leaves too. I usually buy a couple of traps and place them away from my plants. The trap draws the beetles inside a hanging bag. It’s not perfect but it’s the safest thing to do for edible plants IMO. Any garden center or Lowe’s/Home Depot should have them. Good luck! Thank you for the refreshing pictures and info. I just bought a few herbs, trying to get a start. Ann Dear, I did stop to do something I enjoy – I read your post! OSP is like a little retreat for me where there is peace, beauty, and order. It is a beacon of hope, little by little I’ll get my act together and get my projects done too! You refinished your dining set yourself.i have the same one. I got it at Salvation Army, and it needs the same treatment. Each time I see a dining room photo of yours it reminds ds and encourages me. Thanks Ann! Reading over your first post about your container garden ,your garden now looks fabulous!!!! I am a little jealous of the basil ,mine doesn’t even come close ???? Thank you for the lush photos of your herbs. I like to use pots too. I’m glad you photographed your olive buckets for I did not get to do mine in spring. I really like the look!! I hope to do it for fall and winter! Thank you for the reminder to do something I enjoy. I have not been so faithful in watering my herbs. I used to grow them in the ground but we had such wet weather (unusual) so there were tons of snails. A pot up on a bench is better. I have enjoyed using herbs too. Each year I love planting for cooking and yes–for little posies! I trim my basil flowers and use them as you said. It does smell so wonderful. I still love the olive buckets planted. It got hot then cold here. It is nice you photo them as reminders!!! Wonderful ideas that any one of us can do. The galvanized tubs are perfect being lighter in weight than heavy ceramic containers. I am surely going to try this idea! I agree, Ann, Summer is passing way too fast. I haven’t even planted all the things I intended to and it’s too late for some of them. (:– ( My own little sad face! I love your plants in galvanized “planters”. Do you put holes in the bottom for drainage or do you plant in other planters and set them inside the galvanized pieces? I always plant in plastic pots that will fit down in the various vintage containers I use. But then I have to remember to not let the plastic pots sit in the water after a rain! Somewhat of a nuisance but I can’t put holes in the bottom of a cast iron pot! You know I just read something recently about growing strawberries. The article said not to let the runners stay on the plants because then the energy from the plant for making fruit is diverted into the runners. Have you ever heard that? I hadn’t. I’ve attempted strawberries a couple times but haven’t been very successful. Definitely not enough of a crop to make strawberry shortcake! Sad, but, true! Thanks for the enjoyable post! 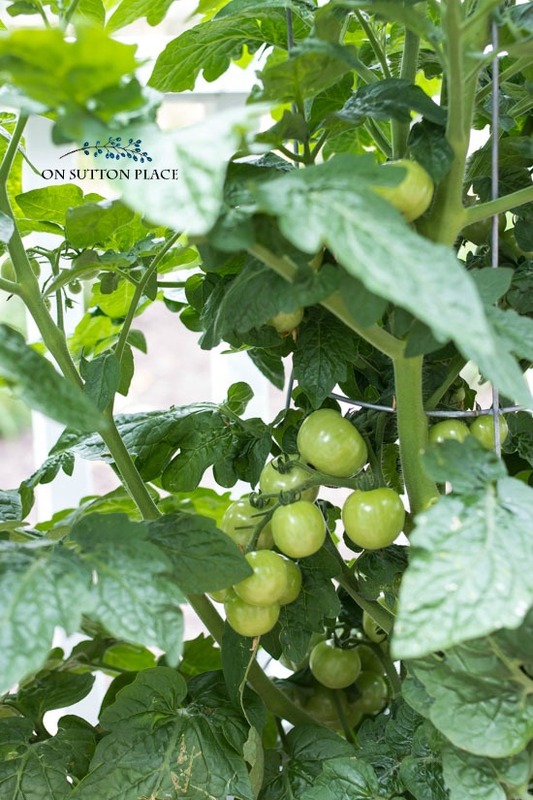 Hope you get some sun to ripen those little tomatoes! I was at my local farm store this week and instead of throwing away the overgrown sickly plants they were drastically reduced and because I had not bought tomato plants this yr. because for the past 2 summers my little spot behind my garage was no longer bearing any tomatoes. My vines grew but I would only get 1 tomato per plant (and I only planted 2). But for 15 cents per plant I decided to buy 2 and put them in buckets that I can move to keep them in the sun. I hope I get a few tomatoes per plant. Yours look so great! Did you buy expensive potting soul? I am going to use my own compost soil. Wish me luck. What a good flavour, can’t forget my lavender for sleeping. Thanks again Lynn ???? Do you place holes for drainage in the galvanized buckets? or are the pots just placed in the buckets to “look nice”? We eat basil leaves like lettuce on our summer sandwiches, fresh off the plant! Get ideas!! Oops! Should have read through all the comments! Dislike using the drill, so will keep rethinking my choice. Never mind! I found your link to when you started the container garden and learned what you did to the olive buckets. Thanks! The plants look great, I love growing herbs! What did you line your olive buckets with before putting in the soil? Love the look! Your basil looks AMAZING! Mine is nowhere near as healthy looking as yours! The tips are all curly. Definitely something wrong with it. My cherry tomatoes were doing great! And then we got TOO much rain. And they all died. Sigh. Good thing I’m not counting on my garden for food! I’d starve! Haha! find out. I live in AZ. so it is different here. Thank you for sharing. I’m with you on the herbs!! I have two long troughs planted with green beans on the deck- first picking will be tomorrow! Have to love summer….and the huge Thunder Moon right now in our night sky. Thank you Ann for sharing your containers with us! Did you have an earlier blog about mulching and edging the rock garden? I need to know how deep to make the edge. Please advise as I am working on it now. Thanks a bunch!!! Hope this is what you wanted…good luck! Beautiful plants and displays. Enjoy every morsel of your hard work. Your containers are looking very nice; healthy plants with fruit just waiting on the sunshine. My tomatoes look like yours, green! I get so anxious for the first red one so I can snap it up and eat it on the spot (just like your strawberries). So yummy. Those vines hanging over the railing will start new plants if you let them meet the dirt (maybe another pot); soon you’ll have many strawberry plants, ready for next summer. Thanks for posting your ‘garden on the deck’. Have a wonderful Sunday. Hi Colleen! Yes I drill holes. I’ve tried alternate ways of drainage but when we get a hard rain, the containers overflow. It’s hard to drill the holes I agree…but it’s really the only way to use your vintage containers for plants. Do u put holes in bottom of bucket for drainage? Hi Sherry! Yes…I drill several holes in the bottom of all my containers. Your garden looks beautiful.You certainly have a green thumb ! I learned this summer that swallowtail butterfly caterpillars absolutely love parsley. One ate almost an entire plant in one day. But I love butterflies so I didn’t mind. My husband and I have an agreement about parsley. He doesn’t mind if I put it on his food as long as I don’t mind that he doesn’t eat it. LOL. Love having fresh herbs available. Looking forward to the info on basil as it grows like crazy and I can’t use it all. I live in Columbus, OH and have noticed this year that everything is growing like mad and blooming early. Your plants look so healthy and lush. 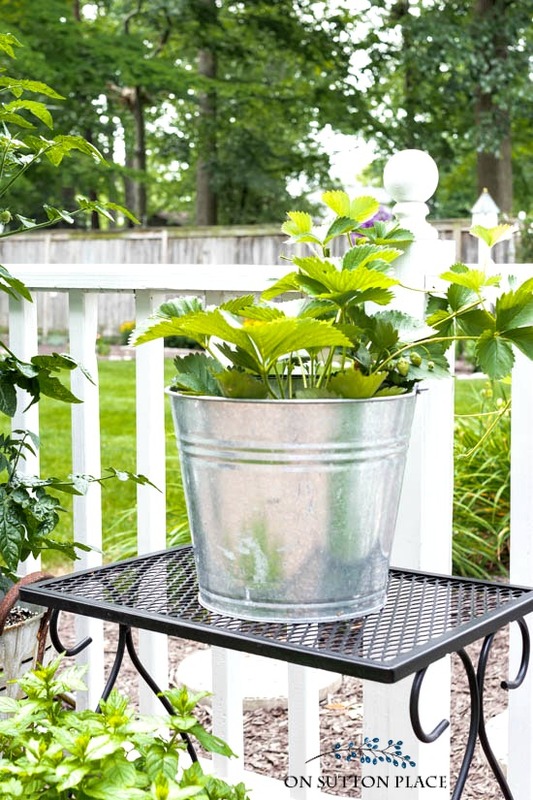 Love the galvanized buckets for planters. I am a faithful follower of you blog, although I do not comment . I work full time as a nurse & on my “off” hours I am a full time caregiver for my husband ( of 43 yrs) who has MS. As you might imagine , time is at a premium. I have a small deck with containers of flowers, herbs & 2 tomato plants , along with several flower beds (that are in desperate need of weeding). I do allow myself time to stop & smell the roses. Just wanted to say … I enjoy your blog & it inspires me in so many ways. Thank you ! Hi Ann, thank you for this info and the beautiful photos. I have two questions, what type of potting soil did you use, and do you water with a fertilizer (like Miracle Gro)? My daughter and I want to try an herb garden on our deck this year. Thanks! Hi Laura! I use Miracle Gro potting soil that contains fertilizer. I sometimes fertilize my flowers that are in the ground but I don’t fertilize the herbs or veggies in the containers. Make sure you use the potting soil (I think they call it Potting Mix) and not the garden soil. Good luck! Thank you for the wonderful idea with the herbs. Having them nearby, instead of walking far to cut them. Also, the galvanized containers. ????????. Have a lovely summer???????? I love how you use the metal pails and tubs. I also put ferns in them and receive so many compliments. You say you aren’t trained in gardening but you do a great job and your plants look so healthy. I think we all need to have more confidence when we try new things. I also think working with plants and watching things grow is good and therapeutic. Makes you close to God. Think about it. Oh my gosh sorry about the deer! Yes…I drill several holes in the bottom of all my containers. Thanks! Your herbs and plants are so green and healthy! Unfortunately, I am dealing with Japanese beetles this summer. I really like your olive baskets and metal containers Ann. What a treat fresh herbs to use in your tasty dishes,and so lush and beautiful too, not to mention the pleasing aroma. I too would love to stop time…hoping your strawberries grow more rapidly…we had a row of plants in the ground years ago and they were abundant amount to harvest. Could be this strange weather pattern we’ve had in he Midwest. Good luck and as always Thank you for this blog.